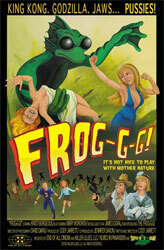 An evil corporation has been dumping chemicals into a town’s lake and it is resulting in all manner of mutants, including a frog man who is really interested in finding a human female to mate with. Enter EPA agent Dr. Barbara Michaels (Kristi Russell) who attempts to bring the company to justice and stop the frog monster before it’s too late. She finds no help from local sheriff, Buford Lawson (Rob Brink), who is good friends with the head of the company. This is a very odd film. It is a straight faced parody/pastiche of the eco-horror films from the 1970’s, and also possibly a feminist take on horror? I say that with a question mark, because Dr. Michaels is a lesbian, which the film happily demonstrates during the opening credits and several times throughout the movie. It feels like the writer is trying to draw some kind of contrast between her and the frog monster’s hunt for a mate, but it’s all terribly muddled. Then again, it is a b-movie and it could all just be for titillation’s sake. The frog monster is gratifyingly dopey looking. The movie is fun when he’s fighting a football team. The movie is much less fun during all the dull exposition scenes. At least it has a catchy theme song. Most important of all Mary Woronov is in it for about a minute.